Marundeeswarar Temple is located in Thiruvanmiyur, Chennai. It is one of the 275 Paadal Petra Sthalams, praised by three Tamil poets known as Saiva Kuruvars,Thirugnana Sambanthar, Tirunavukkarasar ( Appar) and Sundaramoorthy Nayanar (Sundarar) during the 7th-8th century. The temple was patronized and expanded by Chola kings during the 11th century. Spreading over an acre, the temple has two seven tiered gopurams and a huge tank. The Marundeeswarar temple is beleived to cure people of their diseases. Marundeeswarar (Marundu - medicine) is so called because he imparted sage Agastya on curative properties of various herbal medicines. 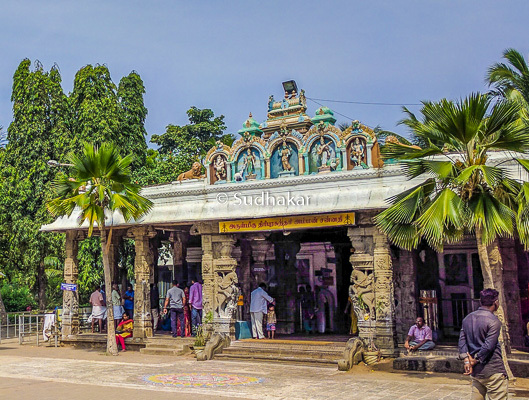 Since then the Marundeeswarar temple has been a place of worship for devotees who come here to get of their illness and other health problems.As per legend,it is said that Sage Valmiki came here to The Marundeeswarar temple to worship Shiva.Sage Valmiki was said to have been blessed here. Hence, this place came to be known as Thiruvalmikiyur, the name changed to Thiruvanmiyur in modern times. We can see the temple of Sage Valmiki very close to the Marundeeswarar temple,in the middle of the East Coast Road, and the roads built around this temple without disturbing the structure.The lingam for which Hanuman is said to have worshipped, the lingam that is said to have cured the curse of Indra, the Lingam which Saint Bharadwaja performed pooja are all seen here. As per legend Markandeyar is said to have performed a penance and prayed to Shiva here. 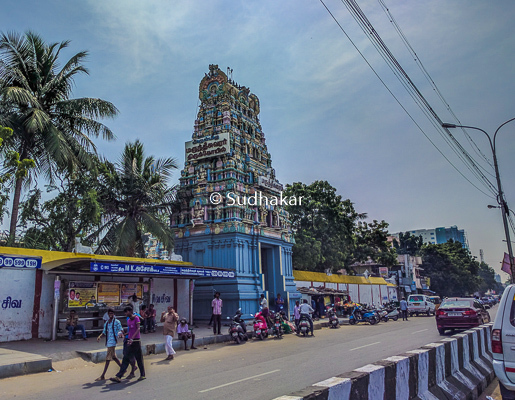 The Temple: The temple has two entrances, one from East Coast Road and the other from West Tank Street both adorned by 5-tiered gopuram (gateway tower). The praharam housing the Somaskanda form of Shiva has 36 massive pillars adorned with beautiful carvings.As we enter through Thyagaraja sannidhi mandapam, we can see the Marundeeswarar sannidhi. On the sides of the sanctum we can see two mjestic Dwarabalagas on either side of the entrance. 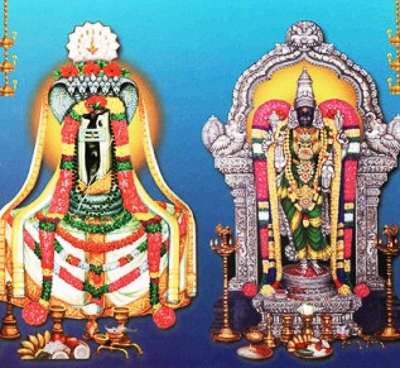 The principal deity , Marundeeswarar in Lingam form is just about a feet high and is slightly inclined to one side. It is said that the holy cow,Kamadhenu, after pouring milk over the Shiva lingam rushed out and pressed a foot on the lingam thus tilting it to a side. We can still see the mark of hooves on the Shiva Lingam where Kamadhenu had put her foot. To the east of the hall we can see five large Lingams. The first and the largest is worshipped during Deepavali's Kedara Gowri Viratham by the devotees observing that viratham. We can Annamalaiar and Abithakuchaklambal and last in the row ,the Sun in a standing posture. You can not see the Navagrahams here. The temple has sannidhis for Ganesha, Muruga with Valli and Deivianai, Gajalakshmi,Veerabaghu.As we go further inside we can see 108 Shiva Lingams arranged in 12 rows.The sanctum of Shiva depicts Shiva in his three forms, Thyagaraja, Marundeeswarar, and Nataraja. The last shrine is for Goddess Parvathi here called as Thirupurasundari blessing us with her four hands. we can see a large Simma Vahanam (Lion) in front of the sannidhi.Next to it we can see the divine Chakram. As we exit we can see the big temple tank on the east side and a sannidhi for Ramantha Swamy. The samadhi of Pamban Swamigal is also found near the sannidhi. Rituals The temple rituals are performed four times a day. During Panguni (Phalguns - mid March-mid April),Brahmotsavam festival is celeberated in a grand manner. Temple location It is situated in Thiruvanmiyur,Chennai. Temple Timings The temple is open from 7:00 AM till 12:00 noon and from 5:00 pm till 9:00 pm. How to reach? Thiruvanmiyur is on the East Coast road and easily accesible by road by allmodes of transport.